In the end I have decided to let the babble stand as I wrote it then, so you may need to make some allowances for the olden days when I see I belonged to more book groups and was doing more challenges than was good for me, or sustainable. It would seem more and more often these days, that I am reading books which I just feel so fortunate to have found. Last year I read and was completely awestruck by Purple Hibiscus by Chimamanda Ngozi Adichie, it's etched in my memory, so I have been on the look out for her second novel ever since. Half of a Yellow Sun was published here in September, I bought it immediately and there it has sat on the shelf waiting for the right moment to read it. Scouring my shelves to come up with a choice for my book group I settled on this one and in fact the group took it a step further and we included Purple Hibiscus as an 'either' or 'as well as' choice for our evening this week. It's a bit of a trepidatious thing this choosing for everyone else so I was a bit nervous to hear another friend say she'd given up on the book halfway through.Who ever wants to choose the book group "turkey of the year"? Not me that's for sure. I'm assured it's impossible to out-turkey a book before my time about singing fish but I'd hate to do it all the same.
" We do not usually associate wisdom with beginners but here is a new writer endowed with the gift of the ancient storytellers". What an honour and, not surprisingly, one that Adichie treasures. 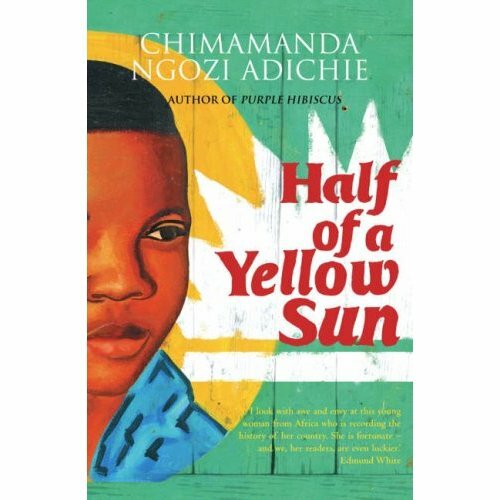 I read Achebe's Things Fall Apart years ago and Chimamanda Ngozi Adichie is certainly carrying the baton for excellent post-colonial writing with Half of a Yellow Sun. Biafra happened in the 1960's and has entered our consciousness and our language as a byword for starvation. We were all acutely aware of what was happening "Eat your dinner, children in Biafra would make that last a week"
"In May 1967 the military governor, Colonel Ojukwe, renamed the region Biafra and declared it an independent state. Three bloody years later he was forced to back down"
Adichie's parents lost everything in the conflict and both her grandfathers died. "The real tragedy of our post-colonial world is not that the majority of people had no say in whether or not they wanted this new world; rather, it is that the majority have not been given the tools to negotiate this new world"
The rest of the book is witness to his observations as we follow Ugwu the house boy, Olanna the teacher and Richard the Englishman and a wealth of other characters as they struggle to cope with the new order. 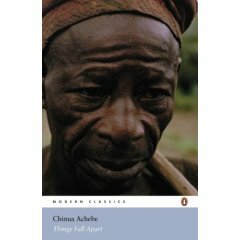 Chimamanda Ngozi Adichie achieves the same deep sense of place that she established in Purple Hibiscus.The gradual decline in food supplies in Biafra and the increasing hunger is dealt with in such a subtle way that it creeps up on you as a reader, much as it must do for any nation facing a famine. It was gradual but inevitable. The sense of fear, chaos and violence is handled as well as it was in Purple Hibiscus, you read it and yes, it horrifies you but you still read it and somehow Adichie offers a redemption that enables you to assimilate it all safely. It's not disturbing or gratuitous, it all has a clear purpose. "My responsibility is to be truthful. I love Nigeria, but I want to be clear-eyed about it. It's so imperfect. But, we don't choose where we are born"
Oh not quite, final final words to me. As is my preference, I've now read the reviews after the book and it would seem we are all of one accord, here's a powerful second novel and a book that I just feel very privileged to have read. Let's see what the others think later this week.